After World War Z are you ready for some more undead action this summer? 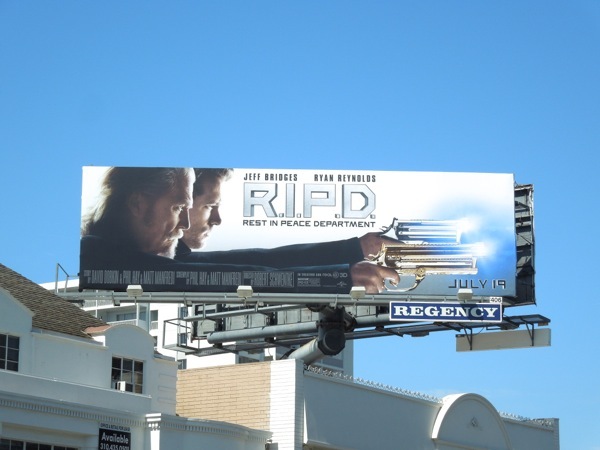 Look no further than the sharp shooting duo of Jeff Bridges and Ryan Reynolds from the Rest In Peace Department, or R.I.P.D., protecting the living from increasingly evil and destructive spirits who refuse to pass peacefully to the afterlife. 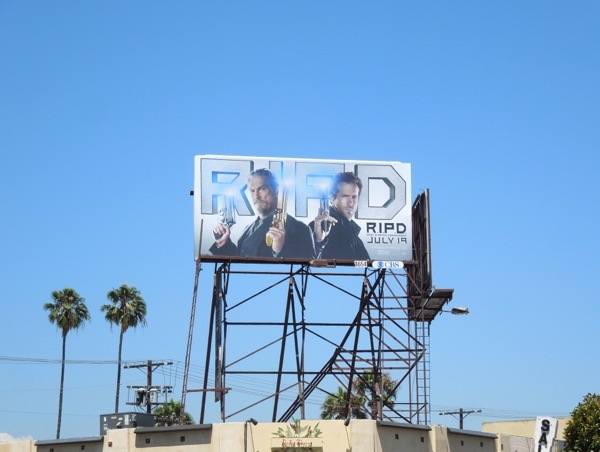 Based on Peter M. Lenkov's comic book series, Reynolds plays Boston detective 'Nick Walker' who is killed in the line of duty and is conscripted to join the supernatural police division and is partnered with veteran R.I.P.D. 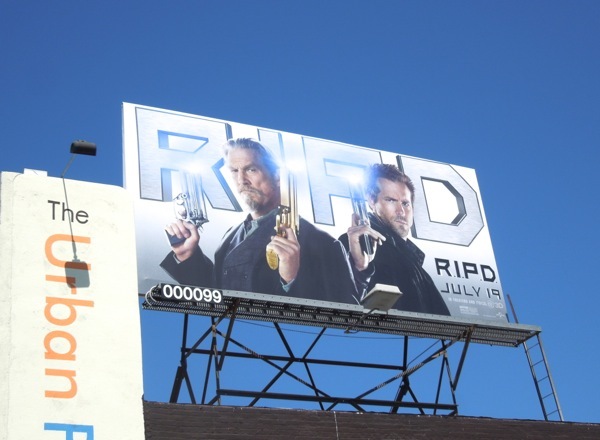 officer 'Roy Pulsipher' (Bridges). 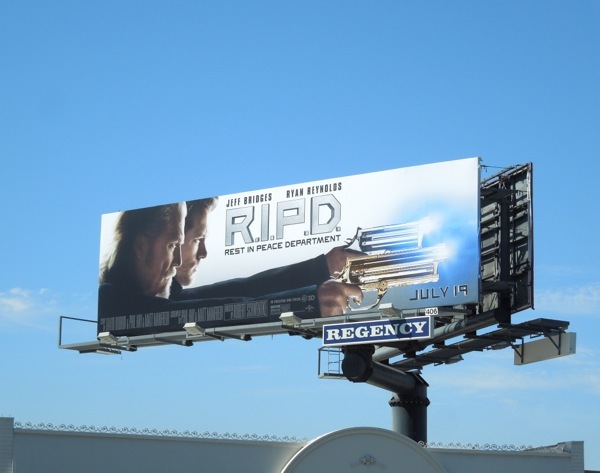 Fortunately these gun-toting billboards have enough of a fantasy element to them with their glowing gun barrels to save them from being just another cop buddy movie ad creative. 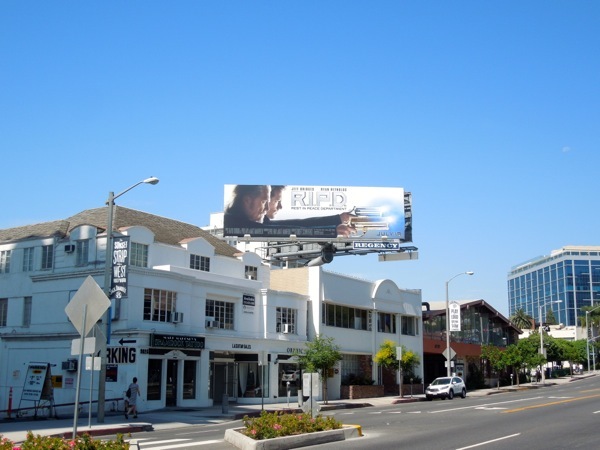 The ads were spied along Sunset Boulevard and Beverly Boulevard on June 27, 2013. Let's hope this otherworldly action-adventure fares better than Ryan Reynolds last fantasy outing as DC Comics Green Lantern. And if this movie doesn't sound like your cup of tea, you can also catch the hunky star voicing DreamWorks superfast snail Turbo at cinemas this week too.